You are currently browsing the category archive for the ‘Urban wildlife’ category. We saw nature in its rawness yesterday evening. 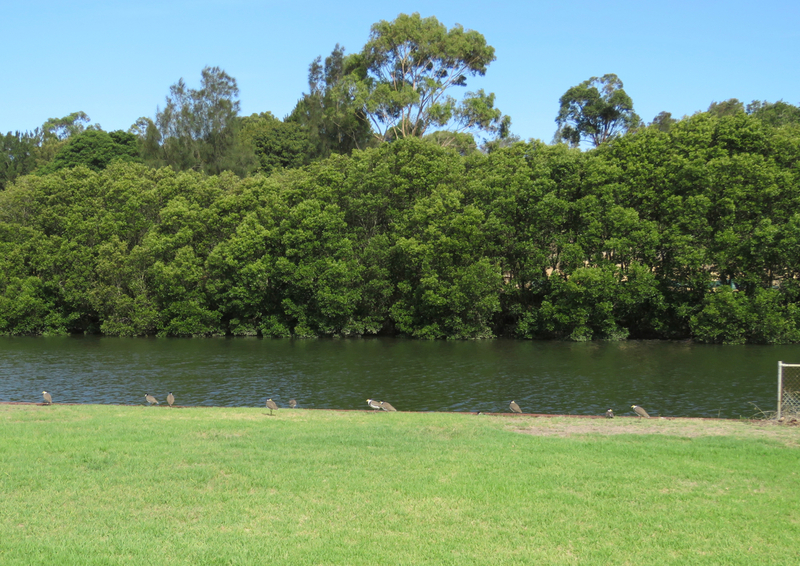 We were riding along the Cooks River when we came across a flock of very rowdy shrieking Cockatoos. 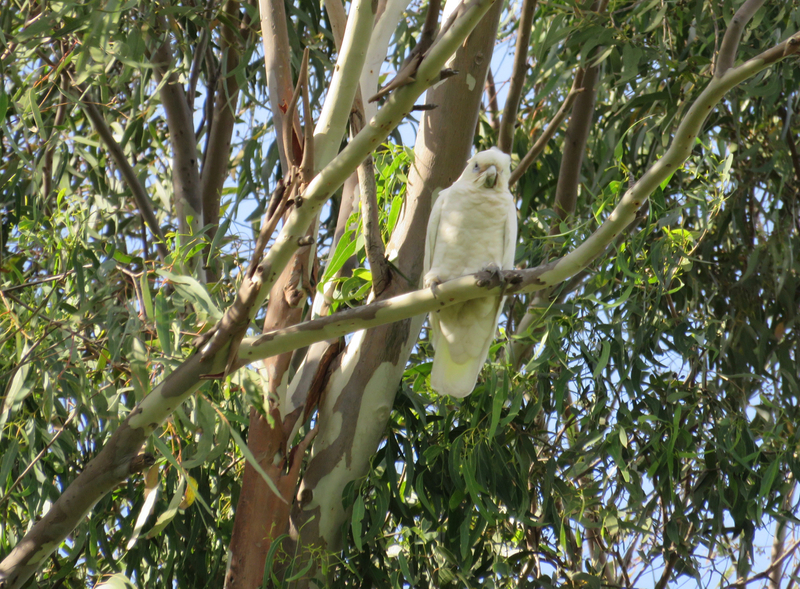 There were around twenty of them all gathered in the one gum tree. The noise was something else. 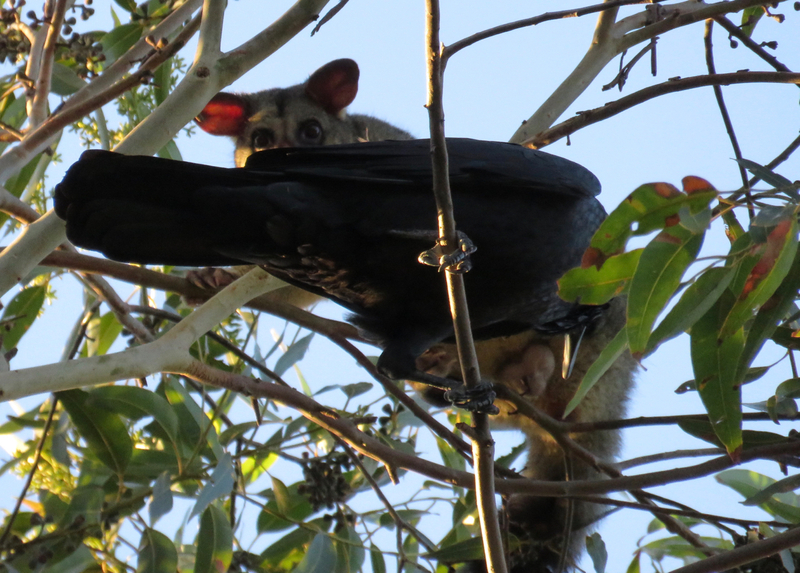 I stopped to take some photos when my husband said, “There is a mammal up there.” I looked around the canopy & saw a brushtail possum with two ravens nearby. 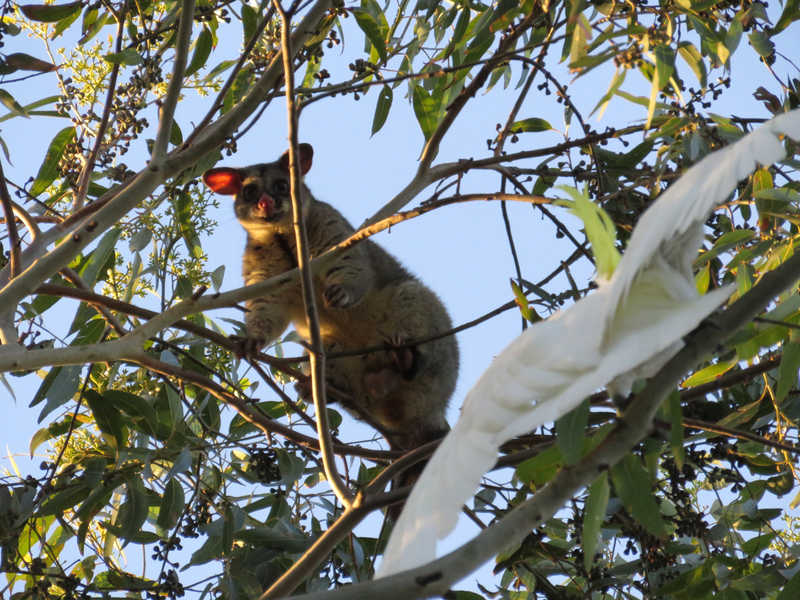 It was about 7pm & the sun was still up, so we had a very good view of this possum. Being nocturnal, these animals are usually only seen after dark. 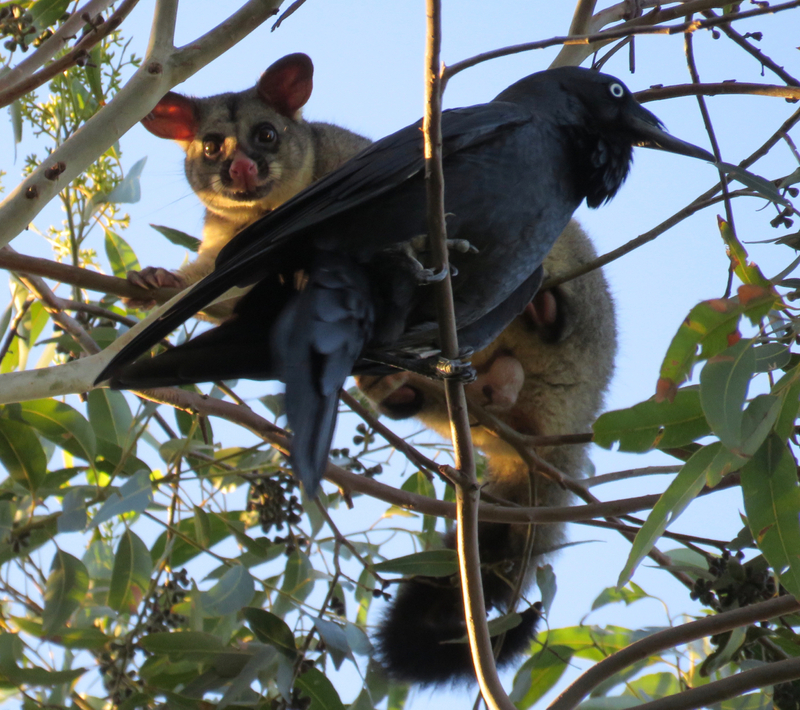 As we watched it became obvious that the ravens wanted to attack the possum. They are meat eaters, usually carrion. My guess is that the possum was seen as an opportunity for food because it was in such a vulnerable position. That is, if they could get him to fall to his death. Whatever the reason behind their actions, the ravens were most certainly wanting to harm the possum. He was standing on a very thin branchlet, having put a branch between him & the ravens. His left foot was poised ready to strike any raven that came too close. So, we had two strong black beaks that could have easily blinded the possum & the long claws of the possum, which would have caused injury to any raven that got too close. 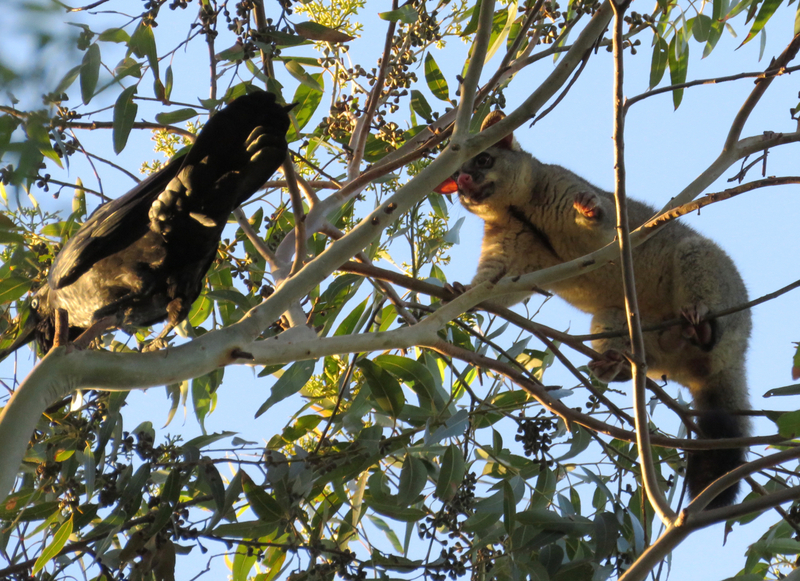 The ravens took turns & tried to strike the possum from underneath, but they just could not get close enough. Meanwhile the Cockatoos were alerting everyone in earshot that a possum was in danger. We felt scared for the possum because he had nowhere to go. Suddenly a large cockatoo entered the fray. 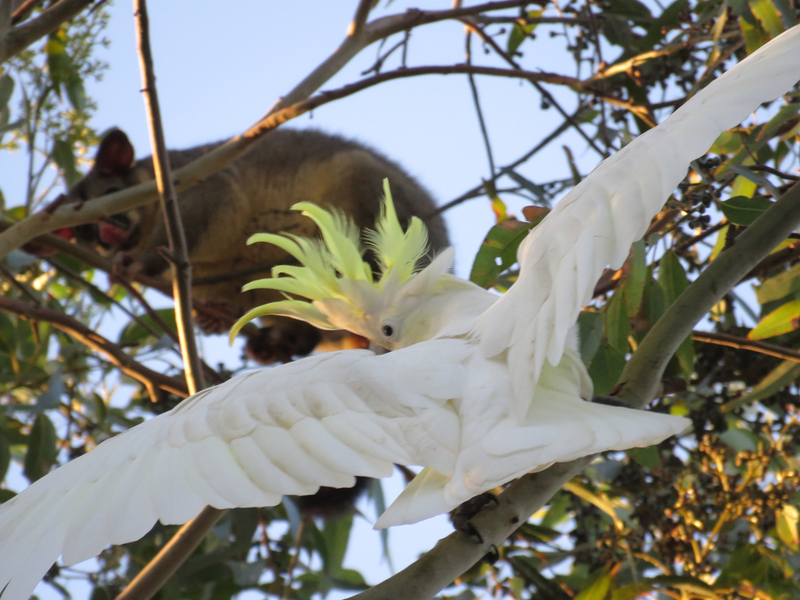 Wings out & crest up, this cockatoo came between the ravens & the possum. Screeching & expanding his size by spreading those wings even more, he managed to push the ravens out & miracle of miracles, they gave up & flew off. 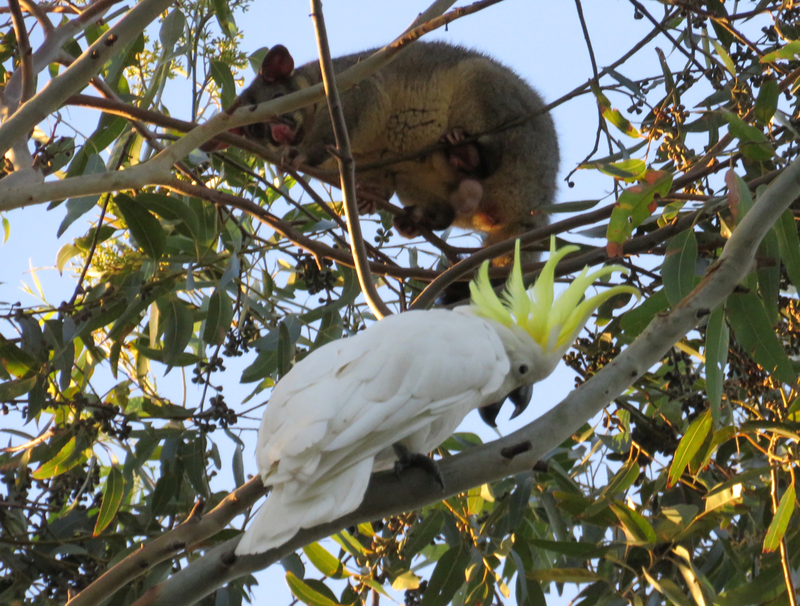 The cockatoo then moved away from the possum still making a performance until he had moved to a different part of the canopy. What a hero! Then the rest of the flock praised his bravery as loud as they could. When we moved on, the possum was still standing in the same position probably getting over what was a near death experience & thinking he will never come out early again. I am pleased that there are possums along the river. We need to keep in mind that trees offer both food & a home to wildlife & plant trees that will serve our native wildlife well. In other words, plant food producing trees as a first choice. Big old trees are vitally important & I expect we will lose many of them to development. 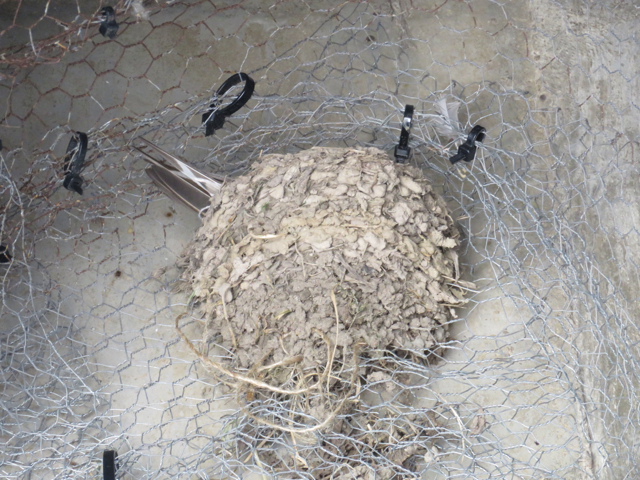 Then the accommodation crisis for homes between birds & animals will become obvious. 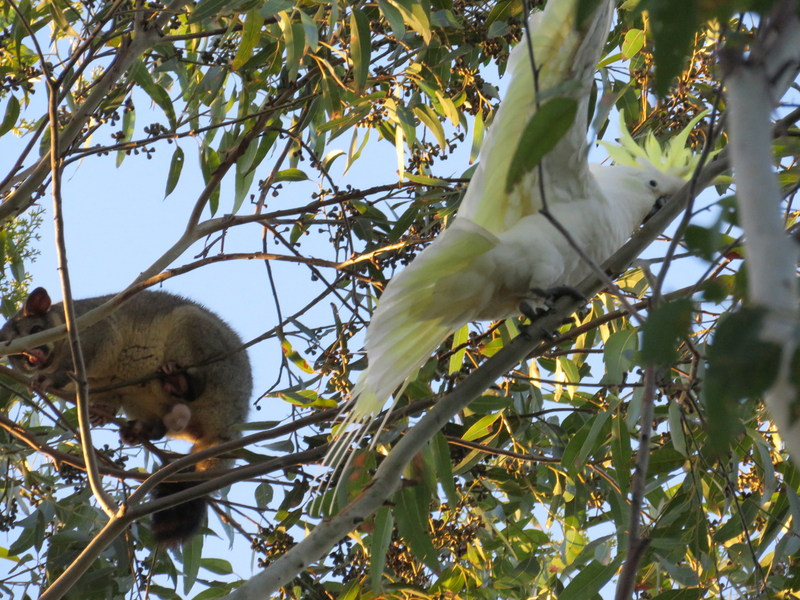 This was a great outcome for the brushtail possum & three cheers for the brave cockatoo who put an end to the fight. Taking a new position now the possum is safe. One had raised his head because I had come near. Prior to this, both bird’s heads were down and although their eyes were open, they appeared unresponsive to anything around them. I saw something unusual today. 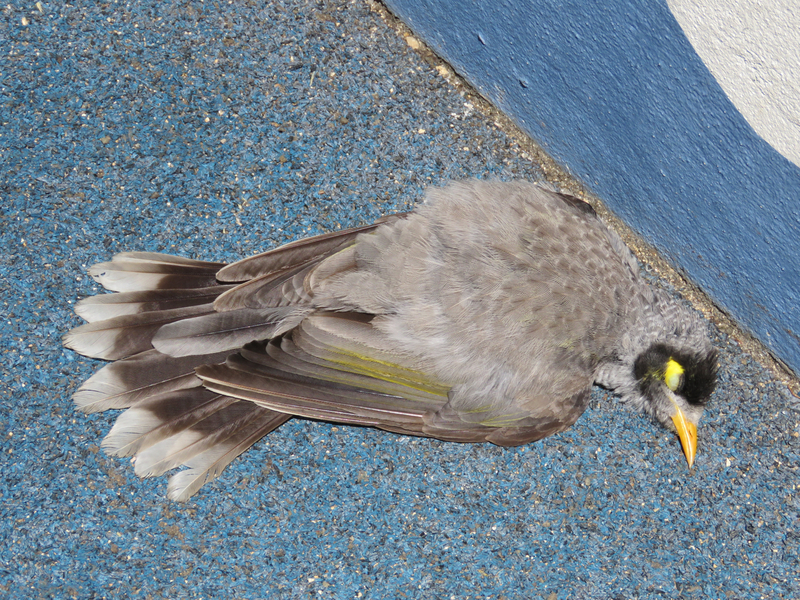 I was eating lunch at a park when I looked over & saw two Noisy miners lying on the ground looking like something was dreadfully wrong with them. I approached slowly talking, but neither birds reacted to me. I was thinking – how do I get these birds to WIRES? I had nothing suitable in which to hold them. I was 1-metre away, leaning over them & making sounds to try to rouse them when they finally moved. Actually, it was more like they became conscious of their environs. Once that happened, they stood up, flew off & from a safe vantage point, proceeded to reprimand me for interrupting them. I was left standing wondering what that was all about. 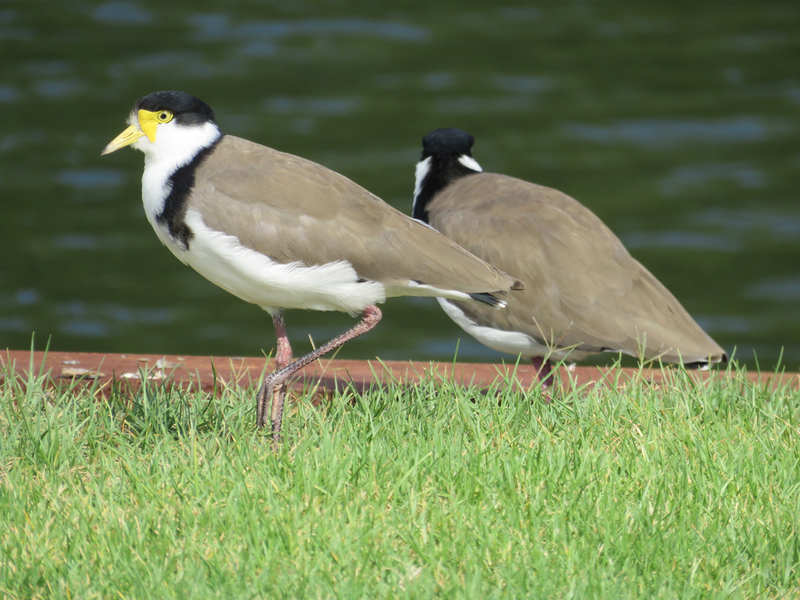 I posted a couple of photos on Twitter & BirdoftheyearWagtail responded with an article from Birdlife Australia that answered my questions. “Have you ever had the sinking feeling of finding a bird lying prostrate on the ground, apparently dead? You approach with trepidation, preparing for the worst, then suddenly, like a phoenix, the bird stands up and flies off. 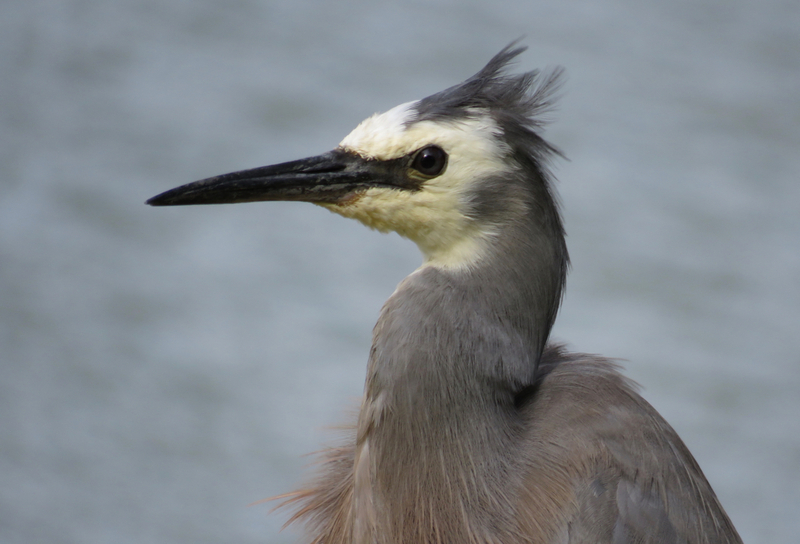 Generate vitamin D from a bird’s preen oil. Ease the discomfort associated with moulting. The article goes on to say that sunning places are in high demand & are used over & over again. This proved to be true for the Noisy miner pair that I was observing. 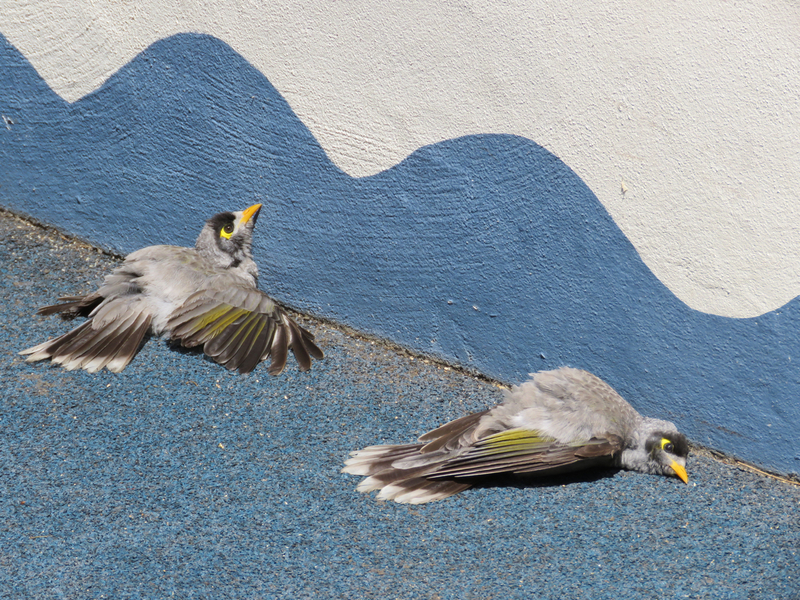 They came back on numerous occasions to lie at exactly the same spot of playground surface. Once they took their pose they appeared to go into a stupor. It must feel blissful to have all that heat radiate through your body when you are as small as they are. Eyes closed and terribly vulnerable in a children’s playground. 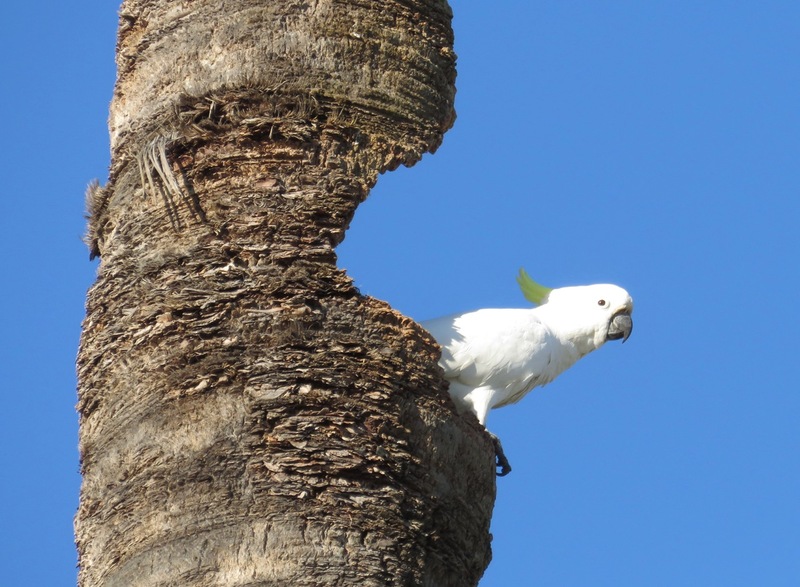 The palm trunk above the Marrickville Golf Course Club House is the new home of a pair of Sulphur-crested Cockatoos. The white dot is a cockatoo. 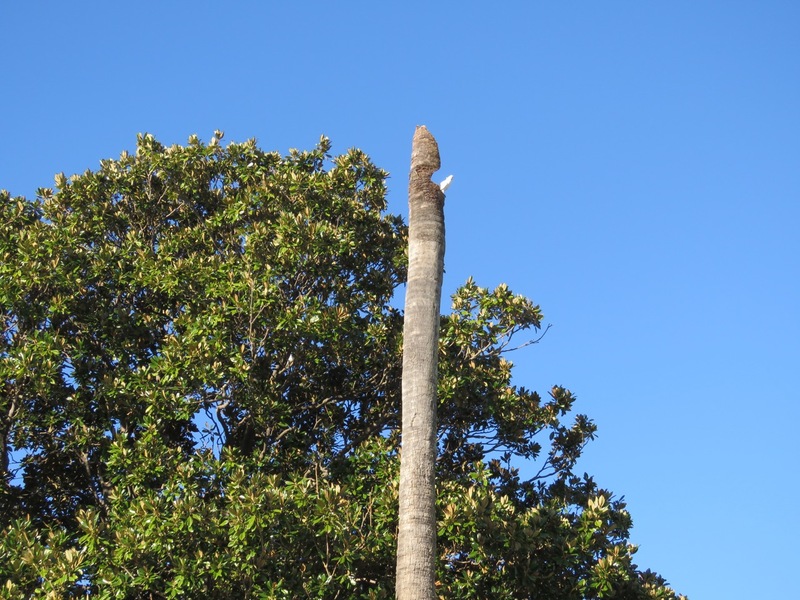 I watched the decline & eventual death of an old palm tree behind the Marrickville Golf Course Club House with some sadness. Trees like this don’t get replanted in my experience. Recently, I saw something happening at this tree that delighted me. What is left is the trunk, which is quite tall. A pair of Sulphur-crested Cockatoos saw this trunk as an ideal home. I presume they made a new hollow or modified a hollow that was starting to form with the shedding of the fronds. Whatever way it happened, it is now a perfect hollow with a balcony & a clear view of the Cooks River & we all know the power of water views. Behind the trunk is a large mature fig tree providing them a safe place to survey the area for any danger before entering the hollow. In true Cockatoo style, once they realised they had my attention, the pair posed & acted out for my camera until I had enough & moved on. They seem very proud of themselves. Even though this tree is dead, it is an incredibly important asset in the Cooks River Biodiversity Corridor. Trees with hollows are rare in the area, so every attempt must be given to retain this trunk. It should not be removed to “clean up the area” or similar. Sulphur-crested Cockatoos nest in tree hollows. Once they find a suitable hollow they stay there indefinitely. The chicks they rear will remain with the parents as a family unit. So, for me, discovering this hollow made up for the loss of yet another tree. 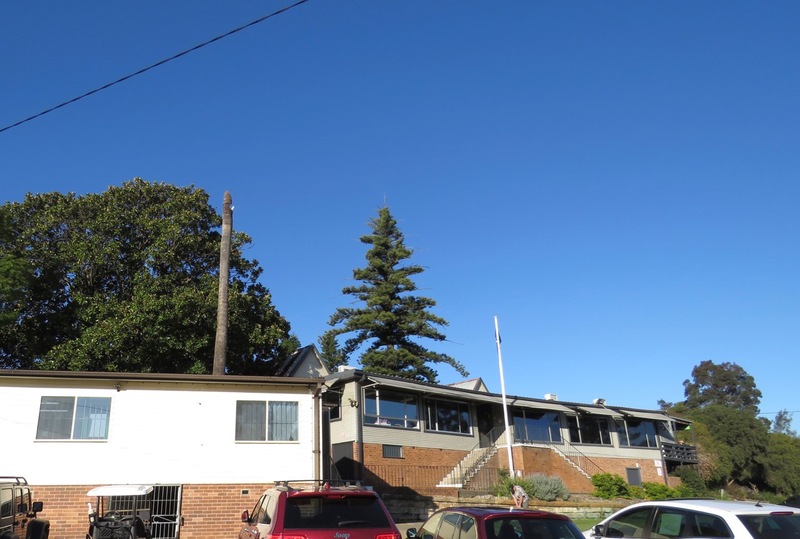 Hopefully, a new palm will be planted behind the Club House. In the meantime, people who are aware of this pair, can have an occasional look to see if they can spot them & any chicks they are rearing. To my mind, the Club House has been blessed with some mascots to screech & cavort above them. What fun! A great home with a big fig tree behind and the river in front. 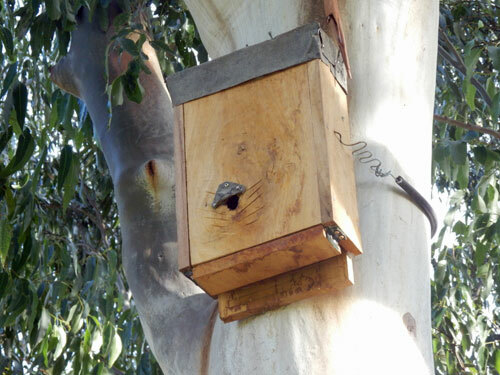 Bat box built especially to house microbats. New research published 28th July 2017 titled, ‘Bat boxes are not a silver bullet conservation tool’ is a bit alarming when it comes to the future of urban bats. They are losing habitat at a rapid rate. Trees with hollows are scarce enough as it is, but all run the risk of being removed by development. Many of us think, myself included until recently, that providing a bat house will help. However, this research has found the opposite is the reality. Just one more reason why we must do our best to save trees, especially older trees. The information on the time it takes for a tree to develop hollows ranges from 100-150 years. Until recently, most articles I read stated that 150-years was the average time a tree takes to produce a hollow. The difficulty of achieving this is obvious. If there is no suitable hollow, there is no breeding. 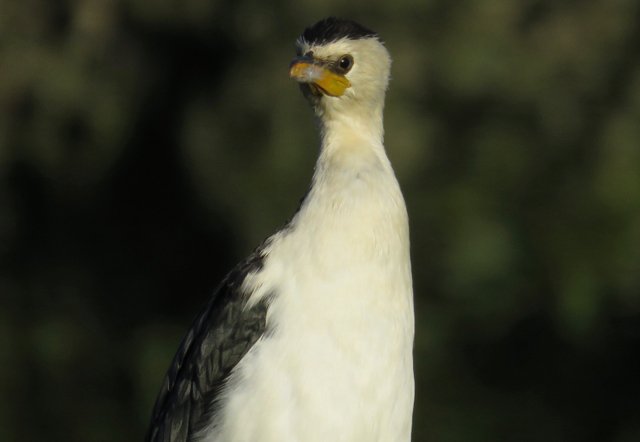 Little Pied Cormorant. 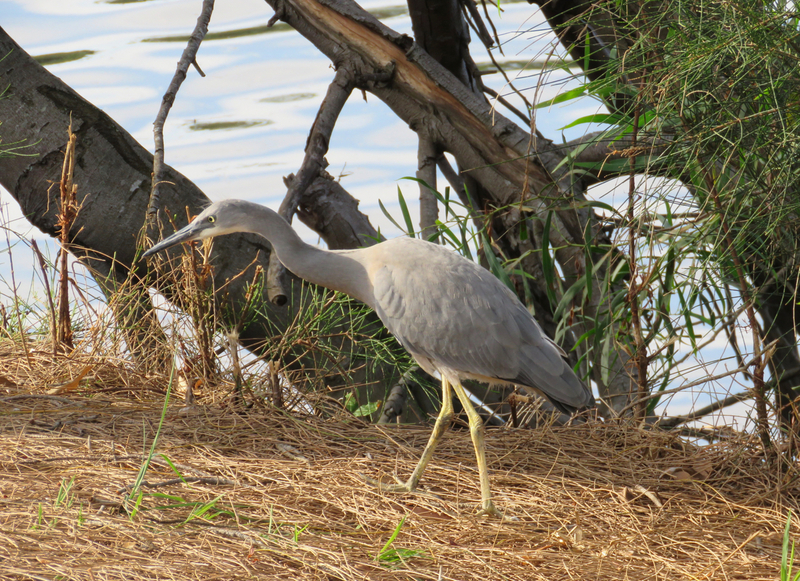 I think we need to increase areas of biodiversity beyond the train line corridors and the Cooks River if we are to help local wildlife. Our gardens are a huge part of this. Bernie Krause is a Soundscape Ecologist. He records the sounds of the natural environment & has been doing so for the past 50-years. 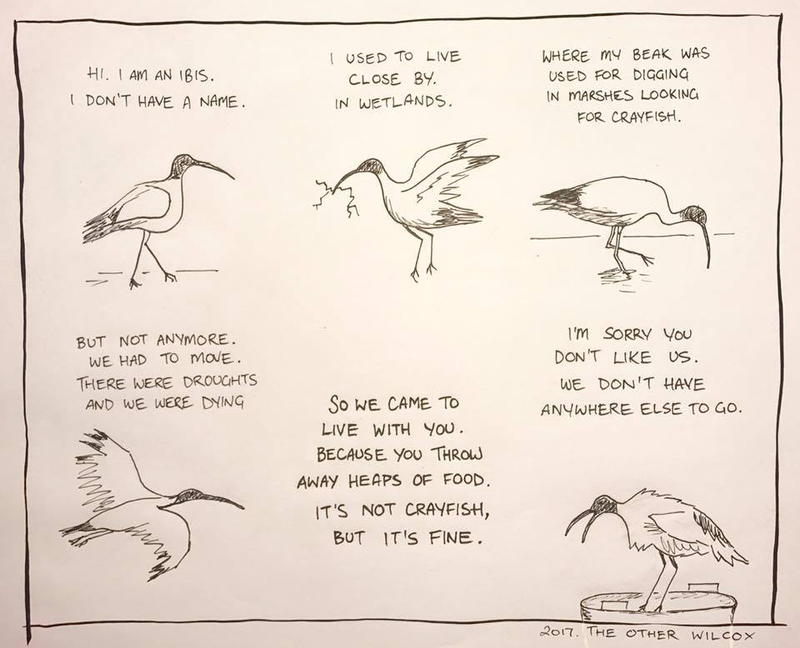 He records in the same place over & over again & sadly can show how much has changed in the natural world. It’s getting very quiet. He thinks this is due to global warming, drought & loss of habitat from clearing of forests. Makes sense to me. This 3.5-minute video, ‘Recording the Sounds of Extinction’ is well worth watching. 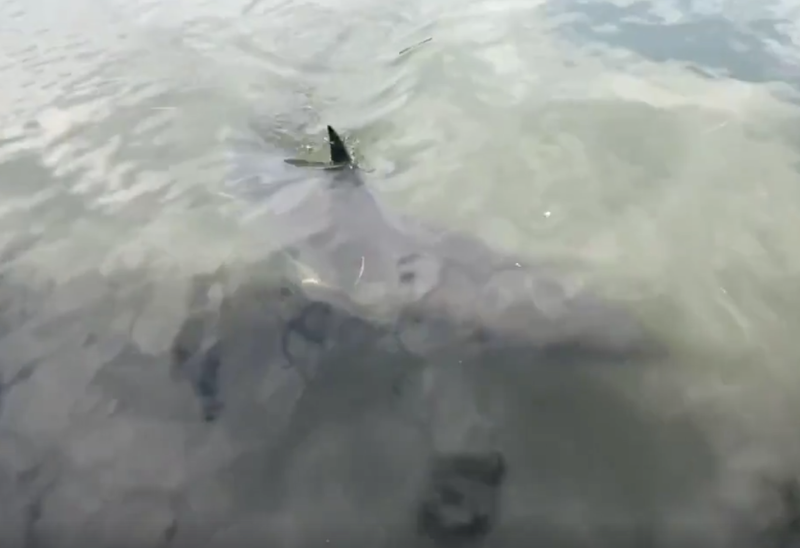 Released in May 2016 the video allows us to clearly hear the loss of wildlife. Our world is changing & not for the better. 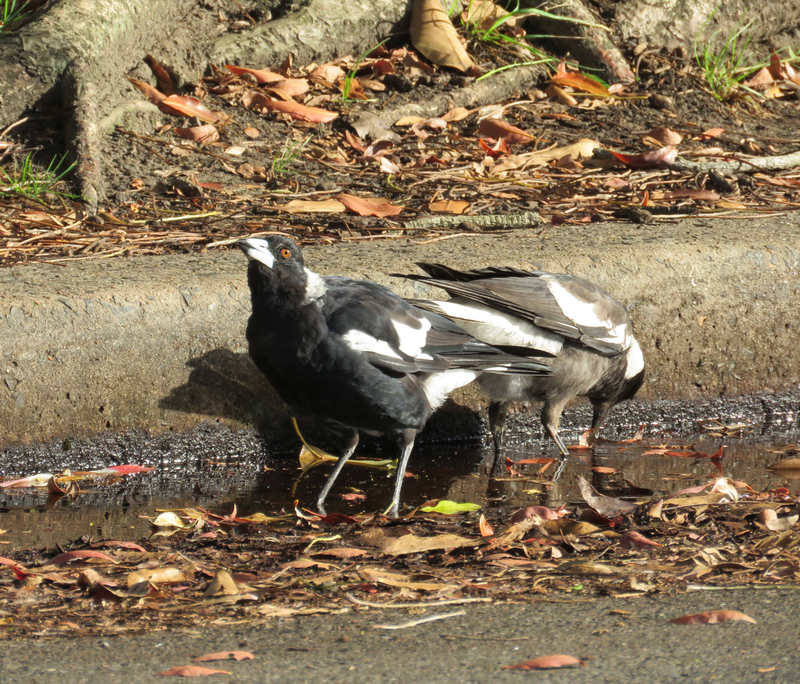 Female Magpie & her recently out of the nest fledgling drinking from the gutter. Fresh water is not readily available for birds in this area that I am aware of so it would be wonderful if the community provided drinking water for them. The heat is terrible at the moment & it stresses our wildlife. Birds can die during heatwaves. If you can put out water for the birds it would be helpful. It doesn’t need to be a birdbath, any wide shallow container will do. Place it somewhere safe & where the birds can sit & watch before they go for a drink, but also in a place where they can easily escape to safety. If your container is deep, place a brick or pebbles inside so the birds can get out. To make it useful to other creatures such as bees & lizards, place a suitable stick to allow entry into & exit from the water. Placing the water in the shade is better because, like us, birds like cool water. Lastly, it is best to replace the water every day to prevent the spread of any disease. Well I wish it was a trip to Canada for two that kept me away from this blog for so long. Life in my family is almost back to normal, so I should be posting regularly again. 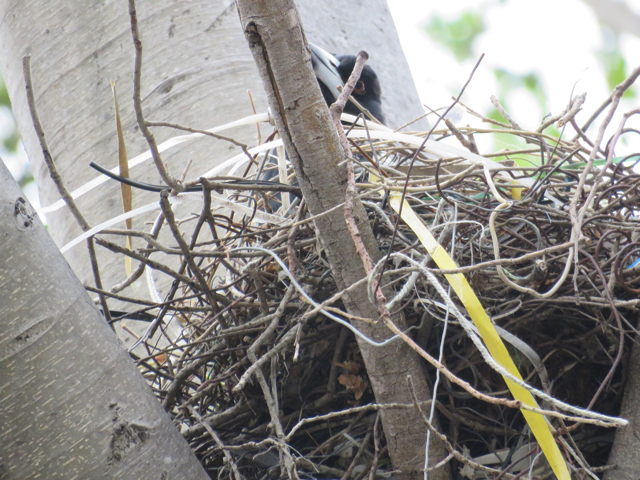 Here are some birds nests to celebrate Spring. No photo unfortunately, but our local Red Wattle birds now have two fledglings, which makes successful breeding in a street tree for this pair three years in a row. A Magpie is back nesting in a local fig tree, also a street tree. It is nice to see the same pair breeding in the same tree a year later. A chick’s head was seen moving yesterday, so we expect to see at least one more in the next couple of days. Last year this pair had two sets of chicks. The first three fledglings left the nest in November to be looked after by Dad, while Mum returned to the nest to sit on another clutch that hatched in December. Then the whole family joined together to look after the youngest two. 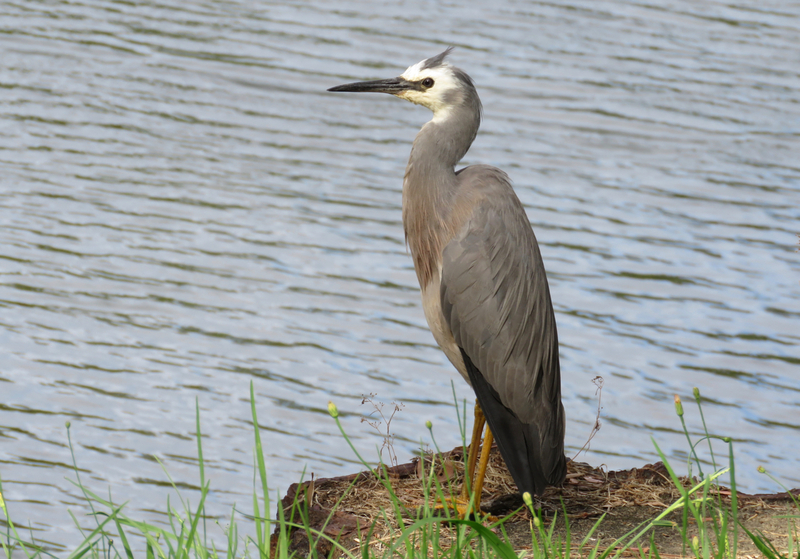 Canterbury Racecourse is a biodiversity hotspot being located next to the Cooks River with great expanses of grass & quite a few substantial trees. 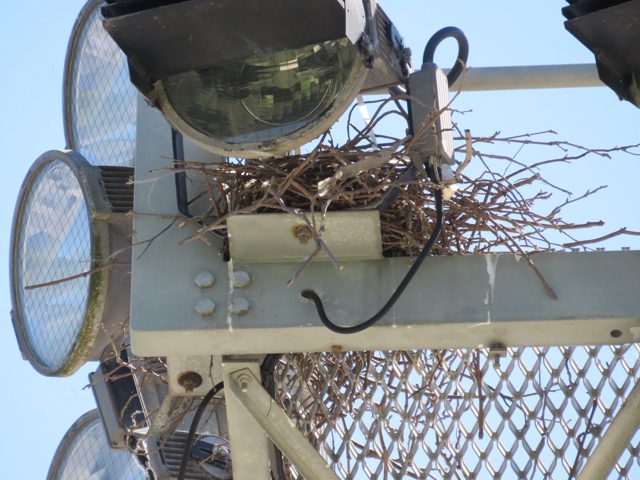 A Raven holds the highest nesting site right up with the powerful lights that illuminate the track. 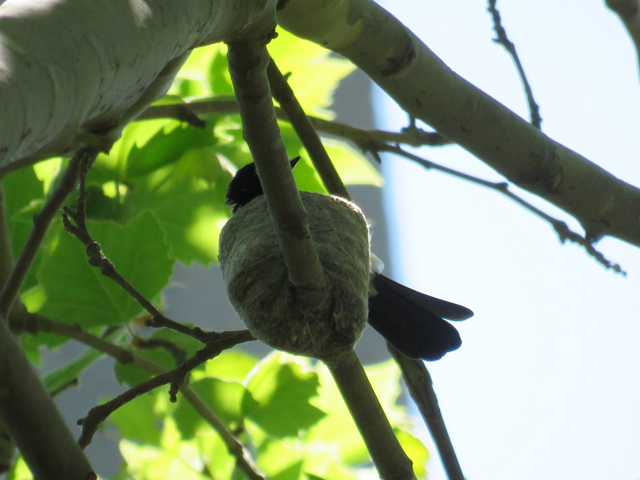 A Willy Wagtail has built a tiny nest on a horizontal branch of a London plane tree. It was hard to spot. 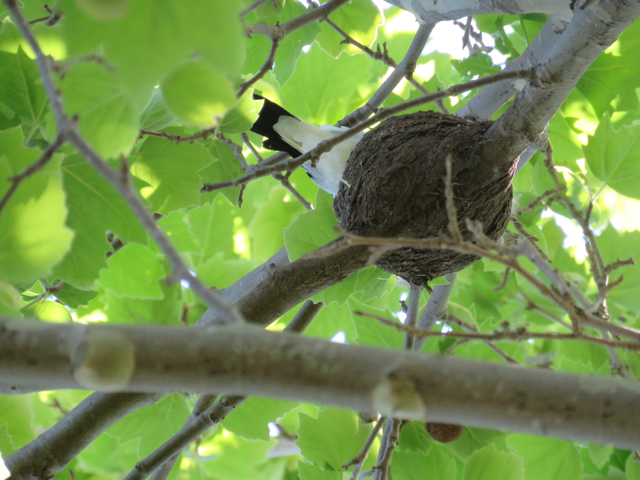 In another London plane tree is a mud nest of a Magpie lark. Lastly, Fairy Martin mud nests can be found all over the race course & it is easy to spot these birds flying above the grass catching insects.